It’s getting close to summer, and various geologists around me are gearing up for field campaigns to exotic locations. Doing this while trying to get the normal semester’s work done ahead of time is pretty hectic, and there is a constant danger of forgetting something. Here is my list of things to bring for my last Tibetan field campaign; hopefully it’ll be of use to others. As a qualifier, this was 2 month field geology trip that involved mapping, bedrock sampling, and cosmogenic sampling (mostly digging 2 m depth profiles). Weather was anything from 40°C (Beijing in July) to -10° C (? didn’t have a thermometer, although one of these would be sweet; maybe a little portable weather station?) w/ all forms of wind and precip. We camped in the field, but most food preparation was handled by the drivers while we worked. It was basically car camping, with big propane stoves and ‘indoor’ cookware, so that is not included in this list in detail. The list for more specialized work (e.g., GPS campaigns) is a bit different; that might be covered in a later post. Northwest camp, South Lunggar Rift. Footwall of the South Lunggar Detachment in background. If anyone has anything to contribute, that’d be great. Logistics stuff could also be good, especially sample shipping, dealing with permits and vehicles, etc. cooking tent, gear, tables, chairs, etc. 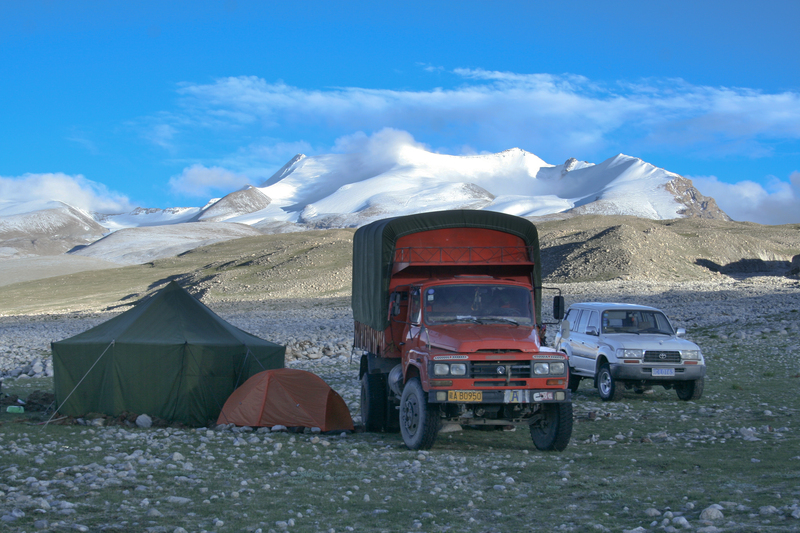 This entry was posted in fieldwork, gear, Himalaya/Tibet. Bookmark the permalink. I met a guy in Manhattan, KS yesterday that you might like to know—a river/canoeing/kayaking enthusiast with very deep knowledge of Kansas rivers and streams, but has also travels to rivers all over the country and internationally.